It might be hard to see a connection between the words “creativity” and “no.” However, I’m finding a few associations here. “No” can be a big factor and word in order to do whatever it is you do to be creative. In my case it is writing; more specifically, rewriting my prequel mystery novel to meet my publisher’s deadline to look at it. I do have third and fourth factors to consider – my freelance work, particularly freelance editing. Ideally it would be a good idea to take three months off to finish rewriting the novel. However, I need the money to eat and pay bills. I also like editing. So, I’m comprising – I’m taking two and a half to three weeks off around Christmas to not only spend time with family and close friends, but to do some rewriting of my novel. Right now I have to steal a few hours here and there from regular work. My eyes do not do late at night at the computer well and my weekends are filled with catching up on personal email and phone calls, seeing family and friends, a bit of housework (I can’t afford to pay someone to do it), and now Christmas decorations, food shopping and the rest of the present shopping. I also want time to read the newspaper and books, walk, and watch TV. The fourth factor is being an only person – no partner/husband or siblings to help out (financially or otherwise). Here is where “no” comes in. When I was growing up and long after, my modus operandi was to please others. Some of that still remains – and it is a good thing where clients are concerned. However, I am learning to say “no” to more things than I used to. Now that I’m a published author I’m refusing to read an unpublished author’s full manuscript for free. Later, I might do a trade – when there is time. I also keep my mentoring of other writers to members of the Canadian Authors Association – I am the Toronto branch Writer in Residence and there are obligations here to honour. The other group is my own East End Writers’ Group which I run. It’s a writing critique group so we do group critiques and I bring in speakers (and also speak myself) on different writing and publishing topics. At my meetings I willingly give any suggestions/advice I can (and ask for it from others). One thing that came out of this (I did the asking) is a trade – one member is helping me organize my marketing for my short story collection and in turn I will evaluate one of her short stories. Perhaps that is the answer to some of the “no” issues. Do a trade with the other person. Or refer them elsewhere. In my personal life there are also time issues – such as housecleaning. As I can’t afford to pay for cleaning services, I’ve decided my house can live with being not so clean and not so tidy as others so I do minimal weekend cleaning (although I do a big houseclean before the East End Writers’ Group comes or before family and friends come over for dinner, etc.). Now, I just have to live with the setup and not feel guilty. And for pseudo-no issues, I use the “delay” tactic. For example, more purging of stuff (mostly paper) in the house, gets scheduled in winter when I do only indoor gardening. In summer, the “stuff” inside takes the trunk (below even the back seat) to my garden outside. Now, if I could just get my mind to stop its whirling about what to do and what not to do… Have to consider my health too. Only Child’s Creativity comes from where? I’m continuing in this creativity vein from last week’s post. There are other areas where my creativity has saved me many times in many areas of my life – problem-solving, juggling clients, and of course writing. This got me wondering. Just where did my creativity come from? My mother? She tended to take after the practical side of her family – the Schefters and was good in the business and budgeting end. However, she was also a Strauss (no relation to the 1800s’ composer Johannes Strauss – but our Strauss ancestors came from the same Black Forest neck of the woods). Mom’s creativity showed up in how she approached honesty and got me involved in it. In my memoir, Chapter 5 , “Mom’s Ten Rules of Honesty,” Mom was determined that I would get my just desserts, so she created this story. “Eat your dessert or the police will come and get you,” Mom says. She points to the front door and nods her head like I better do it or else the Black Maria will roll up the driveway and scoop me up into its dark interior. I stare down at my bowl. Stewed huckleberries and apples. Black smashed berries and their dark juice seep through the apples. Yuck. Smothering the stew in vanilla ice cream can’t hide the taste of huckleberries, a taste that sits in the middle between sweet and bitter. But Mom insists on growing these strange berries in her garden. I start to shovel the mixture down my throat. Then I jump up and take my turn at the living room window. Down the street, Mare’s father cuts his front lawn; Mrs. Armstrong sits on her front veranda, with her collie dog at her feet, and a couple of finned cars cruise up the road towards the dead-end street. Our driveway at 139 lolls in its usual empty state. When I finally get the nerve to look straight down at the veranda outside the window, all I see are the two Muskoka chairs – vacant. (Excerpted from You Can Go Home – Deconstructing the Demons, copyright 2012 Sharon A. Crawford). 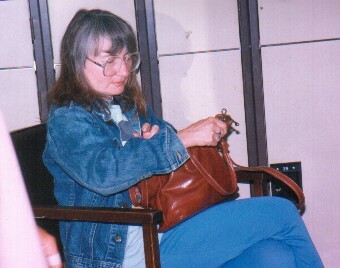 Mom was also supportive of my creativity – writing and teaching. Maybe that’s partly it – heredity and support. The rest is my own doing. I try to live my life creatively. When you are an “only person” and have to depend on yourself, you have to be creative. Finances and budgeting are especially important. Sure, there are financial planners and advisers and I do get advice from the experts. But I have to decide how to bring in the money and how to use it best. Sometimes I do well at it and other times not so well. Perhaps the biggest most recent hurdle was last December when I had to live on under $1,000 – including “stealing” from the money saved to pay off my glasses when the year’s financial payment grace period ran out. Fortunately that turned into 13 months because of the timing of ordering my glasses the previous year and Sears billing date. It also meant working hard to get more clients so in January things turned around and I got out from under. Juggling clients when you are running your own business also requires creativity. I’ve had to learn tact (definitely not inherited from Mom), time management (still learning), and when to say “no” (especially to clients and would-be clients who want freebie work done). Then there is the bane of most of us unless we live in the dark ages – computer problems. I can’t solve most of mine – but I use my creativity to figure out what to do (after swearing a lot) – call in a computer techie, figure it out for myself, etc. House and property problems require the same type of creativity – to do or to delegate. I do both but the former has tried my creativity and I’ve learned that sometimes what you think you can’t do, you can. However, I still won’t climb up on a ladder beyond my height (5’ 1”) because of Vertigo. That’s being practical so I can survive to be creative. What are some of the ways you live creatively? I may delve more into creativity in next week’s post. 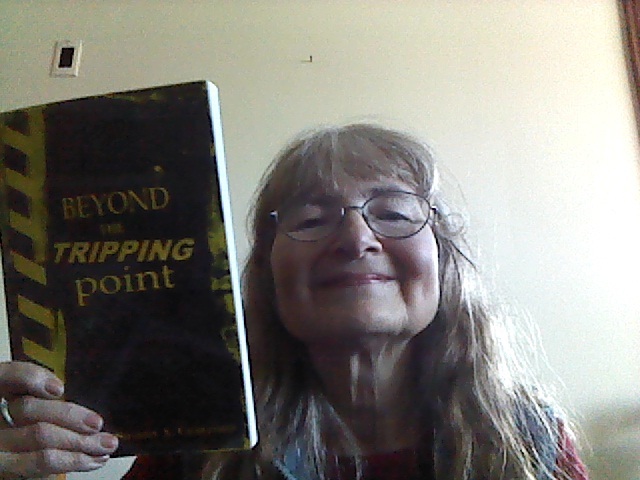 Meantime, take a look at my latest creative effort – my debut collection of mystery short stories Beyond the Tripping Point. Click on the book cover below for more information. 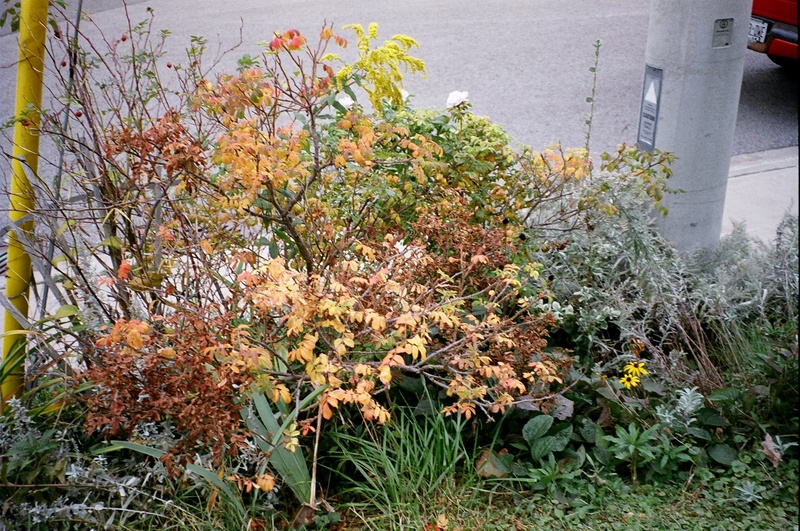 Edge of Only Child’s fall garden facing the street. After my take on irresponsibility and sleep-walking through most of last week, I finally “woke up” Friday. The last residues of it all got blown away in the wind when I hit the gardening ground running this weekend. Then I took it inside to the kitchen. We had a warm Sunday and first part of Monday, so I raked and swept leaves, cut off the messy dead leaves from some perennials going into winter dormancy – hostas, day lilies and peonies, brought in some flowers – yes a few of those still around– pansies, chrysanthemums, lamium, and leaves with berries from the euonymus shrubs. Then I took it indoors – floral arrangements for the front hallway, kitchen table and kitchen windowsill. I also planted seeds indoors in pots for cinnamon and lime basil. I have some potted plants that you don’t usually bring indoors, but I did a few weeks ago – a tomato plant and pepper plant – both are still getting blossoms turning into cherry tomatoes and peppers, a lobelia (annual) still flowering, and a dianthus (perennial). I carried on this indoor gardening into today and along with what was already there (coleus, African violet, Christmas cactus which believes Christmas is in November for flowering, jade, aloe vera, etc.) my indoor garden “centres” in the livingroom and bedrooms are growing (pun intended). Sure, I had to pitch a few dead plants outside , but they taught me – when something is dead, bury it and move on. So, I’m trying to do that with friends’ betrayals, irresponsibility, etc. My creativity continued with cooking (even dessert – I seldom make dessert from scratch, but this time did a rhubarb crisp from garden rhubarb frozen). And I did a few twists on some main courses. Today, I’m making soup for supper. Doing all this creative stuff calmed me and filled me with hope for the future. It also cleared my mind. So did hibernating somewhat this weekend – only one phone call and a few emails, with the only “trips” away from home to get groceries or go for a walk – sometimes combined. I don’t recommend being a permanent recluse – but the occasional getting away from the madding crowd can put things in perspective and kick-start you. Now, I’m revved up for rewriting more in my novel, promoting my short story collection Beyond the Tripping Point and editing clients’ manuscripts. That doesn’t mean I forget about cooking and gardening and even cleaning the house. It means putting what you do in balance, including figuring out what is important. Obviously, some of the stuff I blogged about last week isn’t at the top of my list anymore. ...bad news spreads like locusts, especially inaccurate stories told to me by my mother and which comfort me, only to be crushed by the Bully. Soon after Dad returns home and to work, the Bully chases me out of the schoolyard. “Your Dad has cancer.” She taunts me between huffs and puffs. She waddles onto the sidewalk and tries to catch up to me. “No, it was TB. You’re lying.” I glance at her over my shoulder, then my feet pick up the pace. She’s lying. She’s got to be lying. She seems closer to my back, so I detour into Holy Cross Church for solace. The betrayal/letdown, etc. from friends does not hit the above scale, but it still hurts. As expected, there were a few people invited to the book launch who said they would come and didn’t. Some had very legitimate reasons that came up, one very sad, with a death in the family. I can only sympathize with her and the friends who were sick. But some of the excuses, not reasons, I can only shake my head at. One got invited out to lunch with her son –well, why not just bring him to the launch after lunch? Especially as another friend and writing colleague came all the way down from Sudbury and brought his daughter, her boyfriend and her friend (those three are in Toronto). The more the merrier. Then there is the betrayal for want of a better word. An insert here. I like to help my friends and had arranged for some car pooling between two of them, and talked to both about it and thought everything was clear. Not according to the driver. She phoned on launch day and chided me, saying I should have told her. I had, but apologized for any misunderstanding. They did go together to the book launch. But the phone call drove me over my tripping point; I was in shock, and went through the launch on automatic pilot. Sure, the launch went okay, but a few things I would have done differently if I had been 100 per cent present. Overnight my shock changed to anger, not at her phoning – misunderstandings happen. It was the timing of her phone call. She should have waited until the next day. I learned another lesson. Someone once said that you come into this world alone and exit it alone. Looks like you also go through it alone.